What is a behavior tree? How does it work and what is its role in game AI? Welcome to a series of blog articles about my experiment (read: stumbling around) of marrying data-oriented, memory-streamlined behavior trees with a second representation to ease creation and modification during development. I write it to document my findings and decisions and to ask for your invaluable feedback to build a BSD licensed BT toolkit that is truly useful. 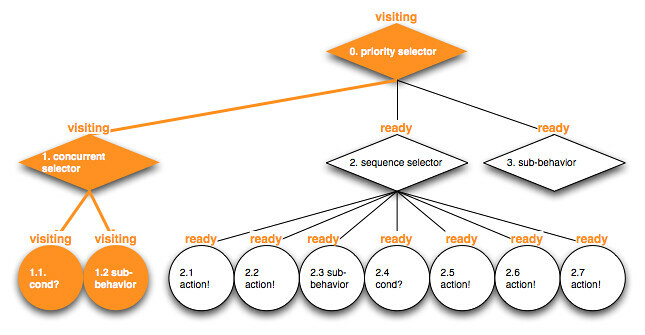 March 10, 2011 – Added a reference to the second article in my behavior tree experiment blog series. March 05, 2011 – Posted bjoernknafla.com, too. 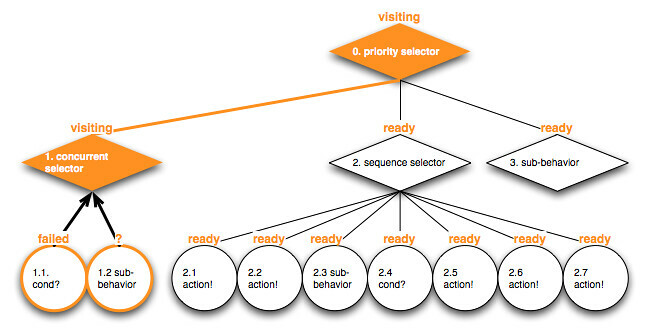 March 02, 2011 – Reader eric wrote a fantastic behavior tree feature analyzation in the comments section. Don’t miss it! February 24, 2011 – added a reference section to the end of the article with additional references not found in the text. February 24, 2011 – added a section to show the advantages of behavior trees over finite state machines based on a question by snake5. 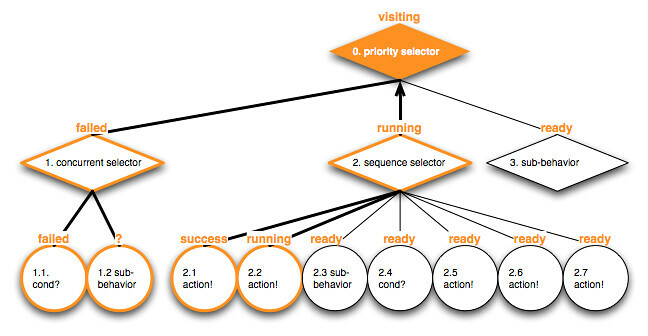 Behavior trees (BTs) are deployed by more and more game AI programmers to implement reactive decision making and control of the virtual creatures entrusted to them as retrospective for 2010 and outlook for 2011. My view and understanding of behavior trees has been fundamentally shaped by here. Factually, behavior trees aren’t just trees but directed acyclic graphs (DAGs). 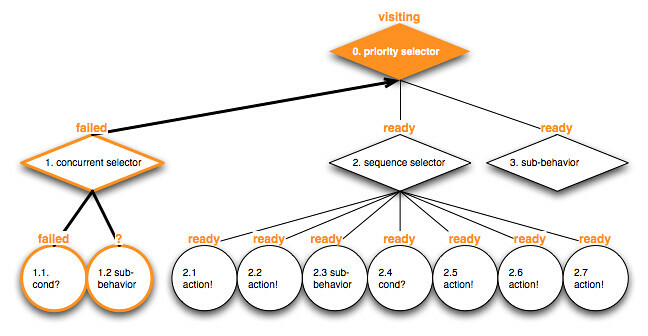 A node can have multiple parents which allows reuse of sub behavior trees and therefore modularization. I’ll stick with the not-quite correct tree term as it is the one most widely used. an error occurred that had side effects to explicitly deal with. 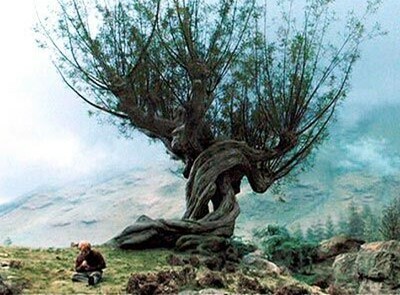 To update a behavior tree it’s always traversed beginning with its root node in depth first order. Each traversed node affects traversal. Selector nodes select one of their child nodes (if available) to traverse next. After the first child node and its associated sub-tree has been traversed the node is re-run to react to the child return status so it can decide if traversal should go up to its own parent node or if it might select another child node to traverse next. 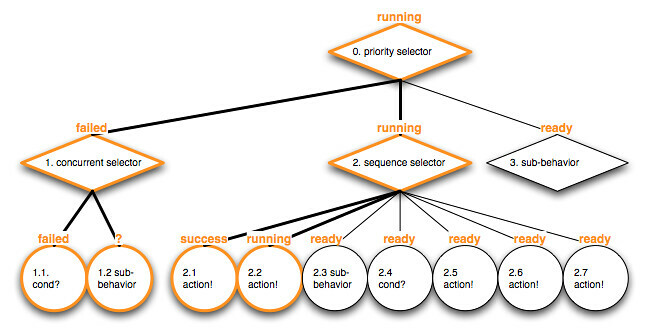 On each traversal priority selectors check which child to run in priority order until the first one succeeds or returns that it is running. One option is to call the last still running node again during the next behavior tree update. The other option is to always restart traversal from the highest priority child and implicitly cancel the last running child behavior if it isn’t chosen immediately again. Sequence selectors run one child to finish after the other. If one or multiple fail the whole sequence fails, too. Without a reset or without finishing the last child node a sequence stores the last running child to immediately return to it on the next update. Loops are like sequences but they loop around (hah, who would have thought!) when reaching their last child during their traversal instead of returning to their parent node like sequence node do. Random selectors randomly (hah again) select which of their child nodes to visit. A running node is visited again until it finishes. Concurrent nodes visit all of their children during each traversal. A pre-specified number of children needs to fail to make the concurrent node fail, too. Instead of running its child nodes truly in parallel to each other there might be a specific traversal order which can be exploited when adding conditions (see below) to a concurrent node because an early failing condition prevents its following concurrent siblings from running. Decorator nodes typically have only one child and are used to enforce a certain return state or to implement timers to restrict how often the child will run in a given amount of time or how often it can be executed without a pause. Actions which finally implement an actors or game world state changes, for example to plan a path and move on it, to sense for the nearest enemies, to show certain animations, switch weapons, or run a specified sound. Actions will typically coordinate and call into different game systems. They might run for one simulation tick – one frame – or might need to be ticked for multiple frames to finish their work. Conditions check that certain actor or game world states hold true. If a sequence node has a condition as one of its children then the failing of the condition will prevent the following nodes from being traversed during the update. When placed below a concurrent node, conditions become a kind of invariant check that prevents its sibling nodes from running if a necessary state becomes invalid. Actions and conditions get filtered access to the actor and the world state through an actor specific blackboard of collected or pre-computed values passed to them during an update step. Each of the child nodes (and of the child nodes child nodes, and of the… you know the drill) might be another behavior defining sub-tree. For this example I only examine child node 1. and 2. in detail. The root of the example tree is a priority node (with id 0). Guard treasure is a concurrent node with two children. The Is thief near treasure detectable? condition only returns success if a trespasser can be sensed near the treasure, otherwise it fails. 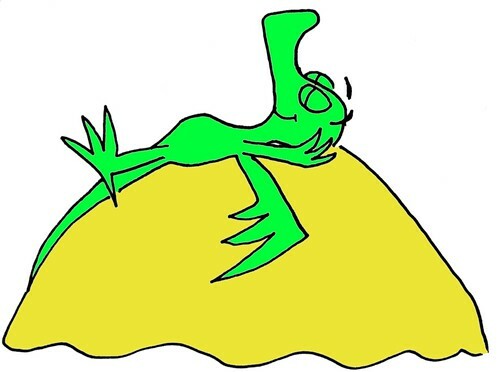 Keep care to not only test if a thief is near the hoard but also if the dragon is in a position to detect the robber. If the dragon is currently away to organize more gold it can’t see thieves to abandon its raid. Recall that a priority selector might always check its highest prioritized child behaviors first instead of sticking to a running child. The Make thief flee behavior might be a sub-tree or might be an action to activate the games combat system. Back to the children of the root priority node – its second child Rob more treasures is a sequence node. Choose a castle to fly to! is an action that selects a castle to raid and searches for a path to it. Via Fly to castle! the dragon flies along the calculated path until it reaches the castle. These are the nodes I cover in the example traversal. The others should be pretty self explanatory by their names. On beginning the traversal all nodes are ready for execution. Let the first behavior tree update begin – it visits and runs the ready to run root priority node 0. The priority node checks its child nodes from the first to the last until a child node returns a success or running state. It fails if no succeeding or running child node can be found. 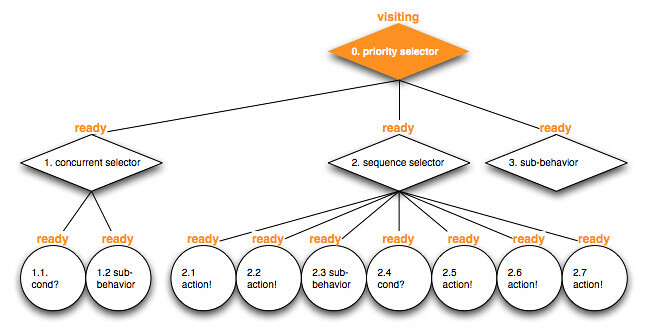 The first priority child behavior with id 1. is a ready concurrent selector. To traverse it all of its child nodes are visited concurrently. Its Is thief near treasure detectable? condition node child 1.1. fails because no trespasser is visible. Therefore the whole concurrent Guard treasure node 1. fails. Priority node 0. tries to run the next child in its priority order. Child 2. Rob more treasures is ready and therefore visited. The sequence node starts by steering traversal into its child node 2.1. Choose a castle to fly to!. A target castle has been chosen successfully. The next child in the sequence is executed – node 2.2. Fly to castle!. As the castle is far, far away it can’t be reached in this update step so it returns running. The sequence selector 1. can’t precede further and also returns running to its parent node. The priority selection root node bails out with a running state, too, it has found a running child node so it doesn’t need to check lower priority child nodes to traverse. This update traversal is done. All non-running nodes are set to be ready before the next traversal. During the next simulation step the behavior tree is updated again and traversal restarts at the root node. It checks its first child node which subsequently still fails because the dragon can’t see a thief nearby its treasure. Therefore traversal reaches the next priority node child Rob more treasures which hasn’t reset its running state and still stores which of its children was the last one executing because no higher-priority sibling has run so it wasn’t reseted. The Rob more treasures sequence node has stored that it last visited its child action 2.2. Fly to castle! – which might succeed, or keep running, or fails during this update step. I’ll stop bombarding you with behavior tree traversal diagrams for now. Behavior trees vs. finite state machines – fight! Why replace finite state machines (FSMs) with behavior trees? The transitions between FSM states give a finite state machine creator great freedom – and enough rope to grow into an intangible mess, as they proliferate and are harder and harder to follow and understand. Hierarchical finite state machines (HFSMs) help a bit in this regard though. 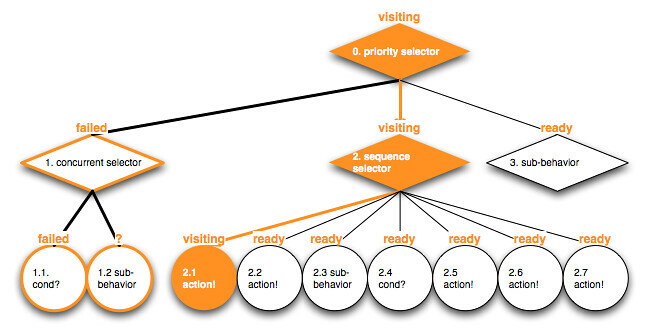 However, the main point where behavior trees shine, is in their clear – even if a bit restricted – vocabulary in comparison to FSMs. For me it is easier to focus on what I want to express while I often feel a bit lost and uncomfortable where to start with complex FSMs. Constraints are good in this case – they function like guidlines for my thinking. Selectors force me to think and view problems in a very specific way. Ad-hoc transition structures of finite state machines become explicit. In addition, conditions and actions as atomic building blocks plug-able into selectors, guide me to make them more reusable. 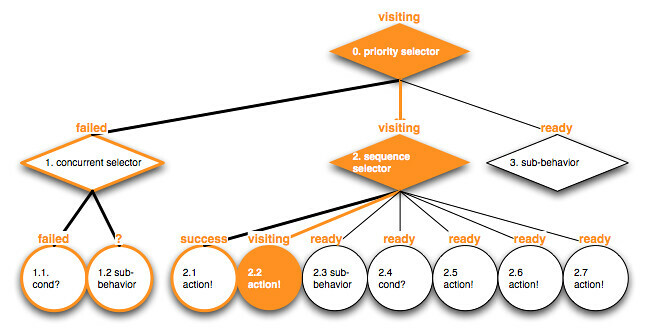 An action or even a whole behavior sub-tree can appear at multiple places in a tree. Sspecial conditions can be grouped with them and guard behaviors to fit into the specific place in the tree. If there are actions to fight enemies with impressive combat styles, then by combining them with conditions, the actions can “rely” on the actor being near the enemies and on having enough room to use the specific combat style. Alex Champamdard often makes the point to think about actions, behavior trees and sub-trees as goals to reach. The tree is formed around these goals to check that they are reachable, to run through the right steps to approach them, and to ensure that there aren’t other, higher priority goals, that need the actors immediate attention. Because of their explicit structured, behavior trees also enable the memory organization I am working on, and therefore allow a very efficient traversal – something I can’t envision with FSMs right now (though I haven’t thought about it in depth). That’s it – what’s next? So much for this post. 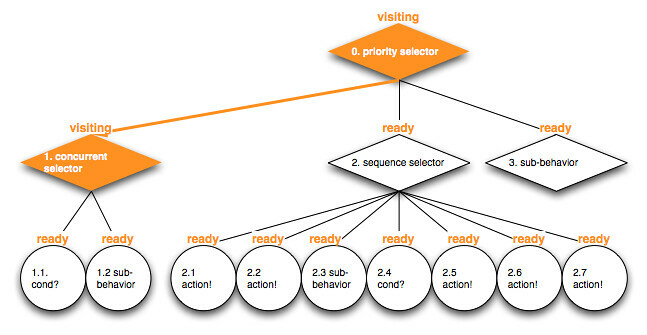 I hope that I could give you a good introduction of what behavior trees are and how they conceptually work. 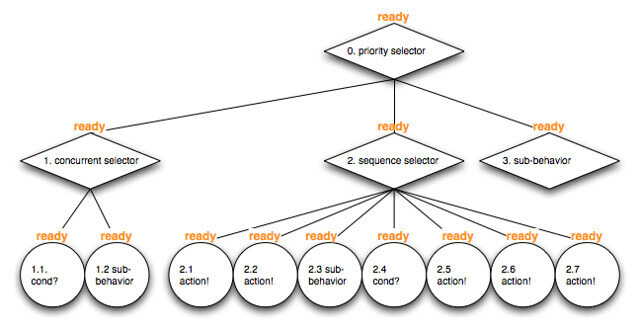 In my next blog post I will motivate why a memory streamlined behavior tree representation makes sense, how I envision such a data-oriented behavior tree to look like, and, I will start with the first test-driven implementation of behavior tree functionality. It would be a blast to see you again in two weeks!